Have you ever wonder how the Swans did on a particular date in history or wondered which league or competition they played in? Well read on to find out exactly what happened, wherever and whenever the Swans played on 4th May. 3 years ago – The 9th placed Swans held FA Cup finalists Manchester City to a goalless draw at the Liberty Stadium in front of a Premier League crowd of 20,242. The match was all the more significant as marked an important anniversary – it was 10 years to the day since the Swans beat Hull City 4-2 to retain their place in the Football League. Leon Britton was the only player to play in both games! 17 years ago – John Hollin’s team were hammered 4-1 at top of the table Brentford in Nationwide Football League Division Three. Tony Bird grabbed a last minute consolation goal for the Swans to give the large away following something to cheer about. The Swans remained in 9th place in the league. 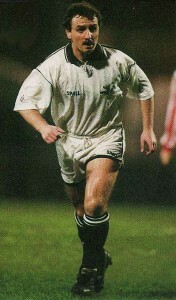 20 years ago – Goals from Steve Torpey and Dai Thomas gave the Swans a 2-1 win over play-off bound Crewe Alexandra at the Vetch Field in front of a Endsleigh Insurance League Division Two crowd of just 2,604. The defeat made little difference to the Swans, as they had already been relegated to the bottom division a few weeks earlier. 23 years ago – The Swans secured a sixth consecutive home win thanks to goals from Russell Coughlin and Andy Legg as they beat already relegated Wigan Athletic 2-1 at the Vetch Field in Barclays League Division Two. 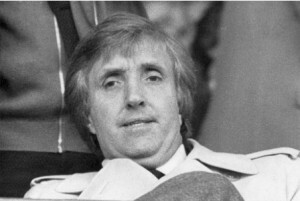 The 7,361 crowd enjoyed the party as Frank Burrows Swans’ secured their place in the play-offs – where they would meet West Bromwich Albion. Unfortunately for the Swans, Jason Bowen would take no part in the play-offs having suffered ligament damage in the Wigan game. 25 years ago – High flying Bolton Wanderers ran-out 2-1 winners at the Vetch Field in Barclays League Division Three as all the 4,713 crowd had to cheer was a first-half Dave Penney penalty. Terry Yorath’s team remained in 19th place in the table but managed to avoid relegation by just 4 points. 29 years ago – The Swans lost their 5th successive game thanks to a 2 nil defeat at Hereford United in Today League Division Four. 31 years ago – Relegation rivals Burnley beat the Swans 1-0 at the Vetch Field in Canon League Division Three. The 5,221 crowd witnessed a certain 37 year old called Tommy Hutchinson whom inspired the Clarets to victory. Were it not for Jimmy Rimmer, the margin of defeat would have been a lot bigger for John Bond’s men. 34 years ago – Former Swans striker Nathan Tyson was born in Reading. Tyson played 11 times for the Swans, scoring once, during a loan spell in 2001. 35 years ago – A Robbie James goal gave the Swans a 1 nil win over Hereford United at the Vetch Field in a Welsh Cup Final 1st Leg. The Swans whom had been promoted at Preston the weekend before made hard work of breaking down their Fourth Division opponents in front of the 13,182 crowd. 45 years ago – The Swans comfortably beat Halifax Town 3-1 at the Vetch Field in the Football League Third Division thanks to goals from Brian Evans, Phil Holme and Dai Gwyther.